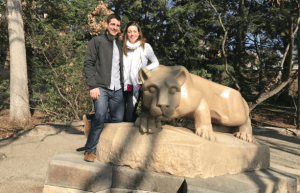 Melissa Schipke is a member of the Penn State University Class of 2009. She graduated as an alumna with a marketing degree from the Smeal College of Business with a double major in advertising from the College of Communications. After her time at PSU, Schipke attended Rowan University to get her Masters of Business Administration. Following school, she worked in a private sector for five years at a Fortune 200 company working with sales management and analytics, which has ultimately led to her current position as founder and CEO of Tassl, a company that creates technologies to increase alumni engagement in order to give people a centralized place where they can continue to feel a sense of community post-grad. She credits all her success to the motivation and support from her personal and professional networks. Stay up-to-date on all things Penn State Homecoming by following us on Twitter and Instagram.